Redeemable within 60 days after check out date. Cashback is temporarily unavailable for this merchant. Alternatively, check out other travel merchants for Cashback. 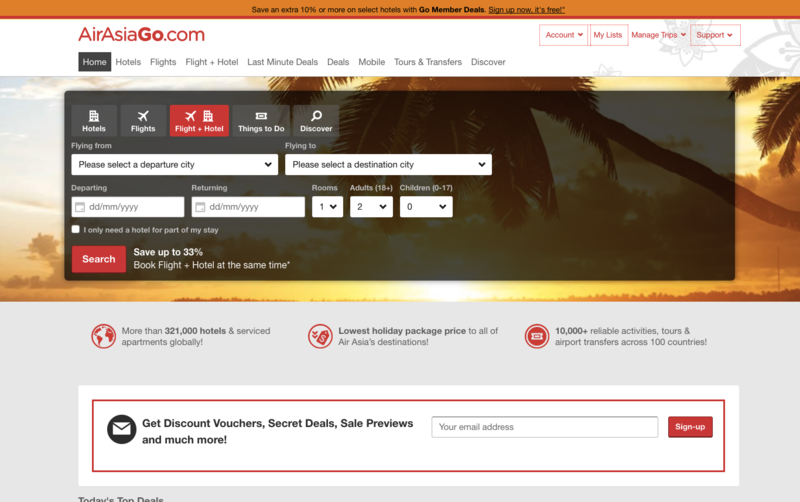 Promotions and discounts online on AirAsiaGo. Limited time only. See merchant site for more T&Cs. Promotions and discounts online on AirAsiaGo. See merchant site for more T&Cs. From seat preferences to hotels – AirAsiaGo Singapore ensures the smoothest of journeys! In the game of pleasant flying, there’s more to the AirAsiaGo promo deals than just cushy seats. Absolutely have to fly at a specific time in the day? Or maybe you just want to bring in a little extra baggage. No matter the request, AirAsiaGo Singapore ensures that even the fussiest flyer is kept happy, and without a hole in their wallet. Be sure to use your AirAsiaGo voucher codes on the existing AirAsiaGo promotions, to get your ideal flight, baggage allowance, stopover preference, and even flight rating! With the great AirAsiaGo promos in hand, you’ll be able to land your favourite country for a stopover in a heartbeat – literally. And once you’ve booked your perfect AirAsia flight, AirAsiaGo Singapore brings you world-class services in weeding out the cheapest quality hotels for your holiday. Banish all your fears of not finding the perfect hotel to suit your budget and your heart – with over 510, 000 partnering hotels all over the world, the AirAsiaGo promotions guarantee that you’ll find exactly what you want, wherever you are. Simply put, the AirAsiaGo Singapore app is your answer to days of endless worrying because you can’t check for flight deals 24/7. Let your laptop take the backseat when you book with the AirAsiaGo mobile app, available on iPhone and Android. The AirAsiaGo Hotels and Flights app lets you stay up-to-date about all the latest AirAsiaGo promo codes, deals and sales offers, even when you’re out and about. You’ll be thanking your lucky stars for the real-time itineraries and notifications that’ll keep you informed about the latest and greatest AirAsiaGo promotions. And you never know when the team at AirAsiaGo might drop an exclusive mobile AirAsiaGo coupon code just for mobile users! And the convenience doesn’t end there. After booking your bargain AirAsia flight, you can use the mobile app to access your booking and itinerary whenever you want, so you can make changes or cancellations in an instant. On top of that, the AirAsia Mobile Exclusive hotel deals give you up to 40% off on great hotels – no additional AirAsiaGo coupons required! View real reviews of hotels, sort them by price, deal, or review, and book everything within just 30 seconds. It’s really that easy, and you get to save your AirAsiaGo voucher codes for the next trip. Get the best of AirAsiaGo voucher codes all in one place – ShopBack Singapore! ShopBack Singapore is your handy portal to all the latest active AirAsiaGo coupon codes, promotions, and AirAsiaGo voucher codes. We’re doing what AirAsiaGo Singapore does best – taking the effort and time of sourcing for the most value and compressing it all into one place just for you. But we’re taking it one step higher – with a ShopBack account you get first dibs on all active AirAsiaGo voucher codes and discounts. And on top of all the AirAsiaGo coupon ad voucher codes available on the Internet, we’re giving you up to 8% cashback on your AirAsiaGo bookings too! And voila! The savings and sweet cashback are yours in just 2 days. Want more AirAsiaGo voucher codes? Stay connected! The only way to get in on all the AirAsiaGo voucher codes and AirAsiaGo coupon codes is simply to be a loyal customer – especially one who follows them on social media! The Facebook and Twitter pages hold more than just airline updates; stay connected and you’ll get instant access to all the latest AirAsiaGo coupons and sale updates – and maybe even an exclusive AirAsiaGo promo code. Open to flying something other than AirAsia? Check out booking site giants Expedia and Agoda for insane flight and hotel deals and promotions, and cashback of course. AirAsiaGo is one of the fastest growing online travel portals in Asia, offering travellers an extensive selection of hotels, activities and travel services to meet every budget and activities of every kind at competitive rates. With over hundreds of hotel partners worldwide and AirAsia's complete flight inventory made available on the site, travellers can book everything they need for a holiday - rooms to meet every budget, activities of every kind and travel services to complement. The AirAsiaGo brand is managed by AirAsiaExpedia, the joint venture company between the world's leading online travel company, Expedia Inc. and the world's best low-cost airline, AirAsia. Headquartered in Singapore, AirAsiaExpedia operates AirAsiaGo's businesses across the Asia Pacific. AirAsiaGo has become the leading choice for travellers owing to its affordable tickets as well as AirAsia deals that ensure an amazing travel experience. To book a hotel or flight or even a bundle of the two, simply log on to the website. Here, the header section mentions all the relevant categories allowing customers to easily navigate to the section they require. Customers can choose to book their flight ticket and hotel room together and save up to 33% of their cost. Step 1: To book a hotel and flight bundle, first enter details such as travel destination and origin, dates and number of travellers on the main page. When you click search, you will first be asked to select a hotel. Step 2: Based on your schedule, AirAsiaGo will shortlist all the best hotel bookings. The hotels with the best AirAsiaGo promo codes and discounts will be shown first. You can also order the list based on options given such as distance from city centre, price, guest rating and recommended properties. In addition, for anyone with special requirements, you can always filter the search using various options provided on the left side of the page. These include property class, area, amenities, property type and location. Step 3: Choose the property you like best to proceed. Don’t forget to look at the AirAsia promotion super saver deals which include the price of an economy flight. Step 4: Once you have identified the property you would like to stay in, click on it to be redirected to the page where you can choose your room. The page will display the various rates and room options available. In addition, you will also be able to see the amenities provided by the hotel along with detailed information. The policies of the specific hotel will also be displayed here including check-in and check-out time, payment options and other aspects. Be sure to review all the conditions carefully for a smoother travel experience. Choose the room you like and click on ‘select’. Step 5: After the hotel and room where you will stay are booked, it is time to book your flight. In case of an AirAsia voucher or deal that includes the flight price in the hotel deal, you will see all the available flights at SGD 0, else the price of the flight will be displayed. Choose the best flight for your AirAsiaGo holiday and click ‘select’. Step 6: AirAsiaGo will put together your entire trip and show the information for review. You can choose to add a shuttle or car service from the airport now or later. Check all the information and click on ‘Continue Booking’ to proceed. Step 7: To confirm your booking, you will have to fill-in important details regarding traveller information and payment details. In case you have an AirAsiaGo voucher code, key it in the space provided. Once all the information is verified you will receive a confirmation on your e-mail. Travelling the world no longer means emptying your savings account with AirAsiaGo deals. Whether you are a long-term planner or someone looking to get away on an impulse, the site always has exciting deals and AirAsia code offers for added discounts. Be sure to check out this section regularly and before making any booking. The airline offers customers an AirAsia promo code or coupon to make their trip more exciting and cost-effective. However, when booking online via ShopBack, customers can not only find all these deals well-organised and visible at glance, but can also earn cashback with each booking. omepage. You can also use the search box to find the link to the link to the store. Step 3: If you are interested in finding an attractive AirAsia discount code, check out the AirAsia coupon code, promo and voucher section. Step 4: You will be redirected to the AirAsiaGo website to browse and book your travel.Step 5: When you confirm your booking, you will be eligible to earn cashback from ShopBack. Some hotel bookings allow you to make changes to your reservation online in your itinerary. Before you make any changes or cancellations, please check the rules and restrictions associated with the hotel and room type booked to determine whether you can receive a refund. The rules and restrictions are located at the bottom of your itinerary. AirAsiaGo does not charge fees for changes or cancellations; however, when the hotel charges such fees in accordance with its own policies, the cost will be passed on to you. Please note that some room types are fully non-refundable from the time they are booked. Additionally, hotels will generally charge a fee if cancellation occurs within 48 to 24 hours of the scheduled arrival. Rules vary by hotel and room type, so it is important to check the rules associated with your booking. If you have booked a refundable hotel room, AirAsiaGo will process your refund on the day of your cancellation. Most credit card companies will post the refund to your account within one to two weeks and to your statement within one to two billing cycles. Step 1: Go to My Itineraries. Step 2: Open the itinerary you want to change. Step 3: Choose Change Reservation under Manage Booking. Step 4: Select Edit for the changes you wish to make. In case you are unable to make changes, cancel your reservation and book it again. Step 3: Click Cancel Room. Step 4: Review the refund and fee details before finalizing the cancellation. Refunds are issued within 7-10 days, but your bank or credit card company may not show a credit on your account until the end of the next billing cycle. BIG Loyalty by AirAsia is considered to be the world’s first Freedom Flyer Programme. Flying more with AirAsia is always a rewarding experience. Earn BIG Points depending on your chosen fare type and how much you spend. The more you fly, the faster you’ll progress through the membership statuses, which enables you to earn even more BIG Points. In order to reward their loyal customers and facilitate better travel, AirAsiaGo also offers the BIG Membership and reward points that customers can earn and redeem with every booking. Redeem trips to over 120 AirAsia destinations: Use BIG Points to redeem your next flight on AirAsia, be it for work or leisure, to over 120 exciting destinations. Priority access to sales: Be the first to know about AirAsiaGo’s BIG sale and participate in the Final Call Sale where you can save up to 90% on certain flights every month. Fixed points redemption at any time: BIG Fixed Points is a member exclusive that allows you to easily redeem flights using fixed points based on the number of hours you fly. Membership Status Discounts: The higher your membership status, the more discounts you enjoy when you redeem flights with your BIG Points. Affiliate credit cards: Be a smart traveller and choose the AirAsia-Citi Platinum Visa Credit Card for exclusive privileges. Special membership perks: Receive exclusive offers, coupon codes and free gifts during your birth month and major festive celebrations. Stand to win contest prizes like passes to screenings, festivals, and other events. For similar travel services, you can check out sites such as Booking.com or Hotels.com.